In the last post I stated that our goal should be to have treatments for every person with every type of Usher of every age everywhere within the next 18 years. To accomplish this goal we need $50 million a year spent on Usher syndrome research. The Usher Syndrome Coalition does not directly fund research. Check out the mission statement above. We accelerate research, we help facilitate it, but we do not fund it. So when I write about how "we" need $50,000,000 I mean the Usher syndrome community needs $50,000,000 a year in the hands of Usher researchers. Who provides that money is another matter. Getting a handle on current funding levels for Usher syndrome research is difficult. In fact, the language on Usher syndrome that was included in the 2014 Omnibus Spending Bill asked the National Institutes of Health (NIH) for a clear accounting of their investment on Usher research simply because the figures were not readily available. There are a number of non-governmental organizations that fund Usher research as well but some fund other kinds of research. So we’re left to make an informed guess. We know spending on Usher syndrome research globally from all sources is definitely less than $10 million annually and probably more in the $5 million range. That’s nowhere near what we need. Remember, one phase III clinical trial can cost upwards of $16 million. So how do we increase that investment? There are four broad categories of substantial funding for Usher syndrome research. These are people like you and me that give money from their pocket to fund Usher syndrome research. That money might be given directly to a researcher or an institution or it might be given to an Usher funding organization like the Megan Foundation, Hear See Hope or the Foundation Fighting Blindness. It might be a direct donation or it might be in support of a fund raising event. Regardless, ultimately this is private money from individuals. Some noteworthy examples are the $25 million Steve Wynn gave to the University of Iowa and the nearly $30 million dollars raised by VisionWalk for the Foundation Fighting Blindness. Neither of these were Usher specific, but both will benefit Usher families. An Usher syndrome Ice Bucket Challenge would certainly be nice. I don’t include organizations like the Foundation Fighting Blindness here. They already fund Usher research. These are large foundations that don’t currently support Usher syndrome research but who have a mission of supporting scientific research and might be persuaded to invest. The Bill and Melinda Gates Foundation, the Wellcome Trust, and others have tens of billions of dollars in assets and the Gates Foundation website says this: “We listen and learn so we can identify pressing problems that get too little attention.” That sounds like Usher syndrome to me. “Because most small biotechnology companies are shut out of large potential markets for widespread conditions such as stroke or diabetes, many focus instead on rare 'orphan' diseases,” writes Avik Roy of the Manhattan Institute for Policy Research. It is estimated that by 2018, orphan drugs will be a $127 billion-per-year business. The pharmaceutical industry is already funding some Usher syndrome research with Sanofi funding the clinical trial on Usher 1b. It would be great to get more interested in this market. In the last post we mentioned the annual spending by NIH on similarly sized diseases such as Huntington’s disease. The total NIH budget is around $30 billion and they fund 237 research/disease areas. Usher syndrome is not currently one of those 237 areas, though we’re trying to change that. NIH also isn’t the only source of potential government funding. For example, the European Commission provided 6 million euros over a four-year period to fund TREATRUSH. The money is out there. So why has so little been invested in Usher syndrome research? Well, funding sources like these don’t just throw money to anyone who asks. You’re an individual donor. Think about your requirements. To whom do you give money? Why did you choose to support those groups? How much did you give? These other funding sources value their dollars as much as you do. They have similar requirements. Large, consistent grants only go to well-organized, cohesive groups with a long-term plan and a clearly understood need. 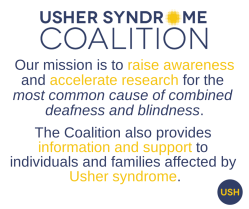 To get the annual funding we are seeking, we need to raise awareness about Usher syndrome as the most common cause of combined deafness and blindness. We need to bring together the passion and expertise of families and prominent researchers from around the world in an urgent movement to find a cure. We need to provide information and support to individuals and families affected by Usher syndrome so that they stay engaged because this is going to take time. That last paragraph reads an awful lot like the mission of the Usher Syndrome Coalition. That’s not a mistake. We are working to find a cure for Usher syndrome. Our work is critical. We may not directly fund Usher syndrome research but the amount of funding we need will never come without the things the Usher Syndrome Coalition does. Did I mention we are in the midst of our annual appeal? In the next post I’ll explain in more detail what the Usher Syndrome Coalition is doing to get more funding for research and how you can help (beyond supporting our annual appeal).